The use of Medical IT devices is increasing in the healthcare industry. Along with these computers, IT resources are required to manage the devices which can include installing and maintaining software, troubleshooting issues, managing a large inventory of devices, and other IT related duties. With the potential to have hundreds, or even thousands of devices in daily use by medical professionals, managing such a large number of devices can require significant IT resources, meaning additional costs. The Onyx ORION solution, supplied by Micromax Health, is a proprietary remote software management application designed exclusively for use with Onyx medical IT devices. It significantly reduces the manpower needed to manage a large number of network-connected medical IT devices. ORION has an intuitive and user-friendly user interface that offers unlimited device control and ease of use for IT managers. A key feature of the software is the ability to manage large numbers of medical IT devices from one centralised location. Due to this, IT professionals increase their efficiency and productivity by no longer having to move throughout an entire hospital, clinic or other medical facilities to configure medical computer devices individually. IT staff can remotely update, configure and apply new settings with ease to any or all devices using ORION. ORION provides important feedback for hospital IT staff with its ability to generate complete reports of computer hardware and battery status for any connected Onyx devices. It can also show which wireless access point an Onyx computer device is connecting to, identifying and locating individual devices. ORION’s Event Manager can be used for preventive maintenance, sending IT staff important service reminders from each medical device. Group System Management allows IT staff to monitor and administer devices in groups, greatly increasing the efficiency when managing large numbers of medical computers. In the past, some device IT management duties required significant resources, for example when updating device software. With ORION, this process has been made much simpler. For example, system-wide application updates can now be scheduled ahead of time with ORION. When the scheduled software updates are ready to be installed, ORION will automatically install the software on the selected devices without any additional input needed from IT staff. Scheduling software updates for a time when device is not normally used also reduces interruptions to medical professionals who rely on these devices for patient care. Similarly, remote recovery of a device can be initiated with ORION. If a device requires a fresh install of an operating system, ORION will take care of it, and the system will operate as if brand new. 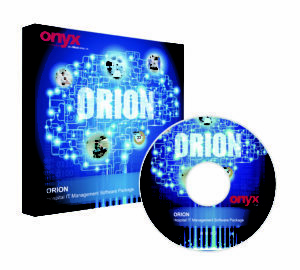 ORION is a complete software solution that controls every part of your Onyx device infrastructure from the server, to the software manager and client devices. This system works the same way as the email servers we use every day to communicate. 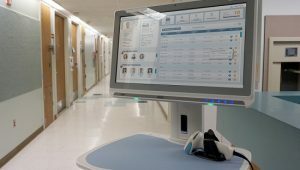 Each ORION system has a single server that connects to nursing carts (clients) that push their information to the server (similar to sending an email). The software manager collects information on the server received from the nursing carts to perform further analysis like battery cycle count or capacity loss. Minsheng General Hospital IT administrators have been extremely satisfied with the performance enhancements and increased efficiency they have gained since implementing ORION. Operations and maintenance routines which once took many hours to complete have now been dramatically cut back to the point where IT staff can now perform their Onyx device managing duties in just one minute, thanks to ORION. Whether you need medical grade computers, medical grade UPS, patient monitors or medical carts, we have the solution for you. To discuss a tailored software solution for your facility give us a call today! IT Managers can remotely perform critical operating system backup and recovery operations without having to physically be at any device’s location. System software/firmware installation and updates can also be performed remotely saving valuable time and resources. ORION includes an integrated e-mail client for regularly scheduled event reporting. With potentially thousands of batteries in use in a single hospital, ORION can monitor them all with diagnostic tools that alert users of any battery-related errors. Real-time remote monitoring provides quick data feedback to help IT managers diagnose and fix system problems. ORION’s user-friendly graphical interface conveniently organises data so that you can quickly and easily review system-wide performance. All IT managers have their own preferences for how to perform their duties. ORION’s customisable dashboard gives IT managers the freedom to set operational parameters to their own liking, maximising efficiency. Why work with Micromax Health? We are committed to providing leading medical grade IT devices and solutions that ensure longevity of product and process.  We have an Australian-based Warranty, Repairs and Support Centre for Asia Pacific including a next-day support service by our field application engineers. We are internationally certified against Quality, Environment and Safety. Call 1300 871 322 or complete our form and we will get back to you.